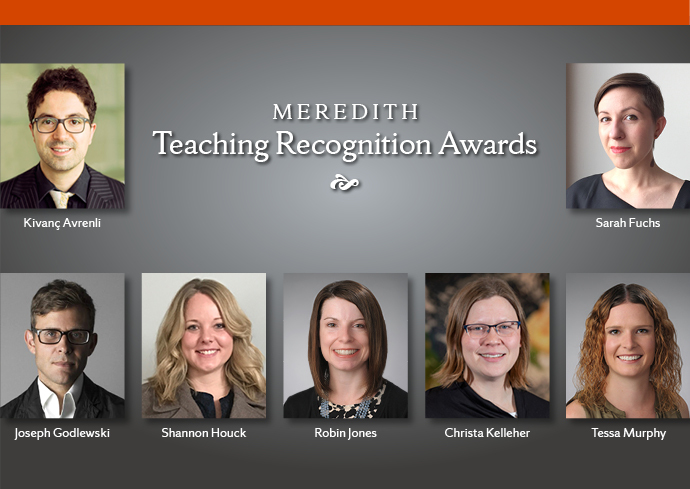 Seven non-tenured faculty members have been selected to receive the 2018-19 Meredith Teaching Recognition Awards. They are Kivanç Avrenli, Sarah Fuchs, Joseph Godlewski, Shannon Houck, Robin Jones, Christa Kelleher and Tessa Murphy. The Teaching Recognition Award is sponsored by the Meredith Professors to highlight non-tenured faculty members. Its specific goals are to recognize excellence in teaching and to encourage a culture of superior teaching among faculty members. All will be honored at the One University Awards Ceremony today at 4 p.m. in Hendricks Chapel. Kivanç Avrenli sees effective teaching as the key requirement for preparing future practitioners and researchers. He primarily teaches statistics and analytics, data intensive courses that are often approached by students with a sense of dread. To do this, Avrenli engages a wide spectrum of technology. He creates detailed video narrations, employing animations and analogies to make topics more understandable. He uses concept-based teaching to make sense of the facts and relate them to a bigger framework. Avrenli consistently uses Blackboard, and has even made videos for his fellow faculty members to explain different features of Blackboard testing tools. Avrenli has been a member of the Whitman community since 2015. In that time, his enthusiasm and emphasis on student success have made him a beloved teacher and colleague. In addition to teaching undergraduate courses, he teaches courses in the Defense Comptrollership MBA program. “We are proud to have Kivanç as our colleague, and look forward to learning from him in the future, so we can all be as good a teacher as he is,” says Koveos. Sarah Fuchs is a strong believer in principles of active learning. In her courses, students actively participate in discussions, write, interpret and build digital resources, and then reflect on what they have done. A member of the Department of Art and Music Histories faculty since 2016, Fuchs teaches courses in film music, sound studies and European art music, especially opera. She organizes her teaching around complex, open-ended questions that encourage students to think deeply and creatively about their assignments. Fuchs also encourages her students to think carefully about the means and methods of constructing historical narratives. Fuchs was a co-organizer, with colleagues in African American studies and English, of Syracuse University’s first Digital Humanities Research Symposium in the spring of 2018. The symposium showcased student work in the digital humanities in a wide range of disciplines. She is currently co-organizing a second symposium, which will be held on April 24 from 9 a.m. to noon in 500 Hall of Languages. Amanda Eubanks Winkler, associate professor and director of undergraduate students of music history and cultures, says Fuchs has taught her a great deal about new strategies for being an inclusive teacher. “Her pedagogy is kind and compassionate and her students respond to her willingness to connect with them on a human level,” she says. Joseph Godlewski says lecture halls and studios are potentially transformative spaces. Godlewski, a member of the School of Architecture faculty since 2013, teaches undergraduate and graduate design studios, large lecture courses in architectural theory and advises thesis students. He also teaches a seminar on the politics of space in the Renée Crown University Honors Program. “My scholarly and pedagogical objective is to equip designers with what I call global disciplinary knowledge—a broader, more diverse and fine-grained understanding of the inherited techniques, methods and vocabulary of the discipline of architecture,” he says. To do this, Godlewski uses innovative teaching techniques and creates adaptive learning environments in three areas of inquiry: challenging the theory/practice divide, developing a more nuanced sense of architecture as a “global” discipline and transforming studio culture both within and beyond the classroom. He purposefully crafts his teaching methods to resonate with today’s students, and has worked on diversity and inclusion initiatives within the school. His teaching recently earned him an ACSA/AIAS New Faculty Teaching Award from the Association of Collegiate Schools of Architecture. Godlewski’s mentorship is deeply valued by students in the School of Architecture. “Among both undergraduate and graduate students, Professor Godlewski is admired and appreciated for his wit and candor, his mentorship and his criticisms, as well as the amount of care and effort he puts into the architecture school and his students,” one student said. Lori Brown, professor of architecture, says she greatly values Godlewski as a colleague. “I cannot speak highly enough about Joe—the evolution of his teaching, his commitment to educating future architects, his contributions to the school, and the future promise he demonstrates as a teacher and a researcher,” she says. “I do what I do because it is fun. Teaching gives me joy,” she says. “I want students to enjoy the learning process, to understand that learning is inherently interesting, worthwhile and rewarding—not something to pursue simply for the sake of a transcription notation or the title at the end of the name. In her three years at Syracuse, Houck has quickly become a legend on campus, says Amy Criss, professor and chair of psychology. She teaches more than 2,000 students a year in Introduction to Psychology (PSY 205), the department’s largest course. Houck redesigned the format of the course, as well as assignments, exams, grading, lectures and recitation sessions. She also recreated the course as an online offering, implemented a teaching assistant training program and wrote a TA guidebook and instructor handbook. “Dr. Houck is our department’s ambassador, and she is doing a great job of increasing student interest in psychology,” Lewandowski says. Robin Jones loves to be creative in her work and to try new approaches to making content accessible and understandable for students. Over her teaching career, she has identified three teaching goals which are at the core of her teaching philosophy—teaching students to master scientific content, gain critical thinking and problem-solving skills, and to learn how to work effectively in teams. “My aim is to achieve these goals while taking into account the diversity in my classroom and using approaches that aspire to facilitate all learning for all,” she says. Jones teaches undergraduate courses in neuroscience, coordinates neuroscience undergraduate and graduate courses across departments and serves as the primary advisor for more than 200 students in the undergraduate Neuroscience integrated learning major (ILM). A member of the Syracuse University community for three years, Jones has redesigned two courses to use team-based learning approaches. This resulted in transitioning the courses from a traditional lecture format to a small group learning format. In all of her courses, she uses complementary active learning methods to maximize student learning. There is broad recognition that we experiencing unprecedented changes that are affecting the timing and distribution of water around the globe, says Christa Kelleher. “Syracuse University students are the next generation of professionals that will contend with a world experiencing change. My goal, as an educator, is to give all of my students a well-rounded, interdisciplinary appreciation for why water science matters to their lives and their futures, whether they are Ph.D. students specializing in hydrology, Earth science and civil engineering undergraduate majors expanding their perspective on the field of water resources, or a first-year undergraduate setting foot in their first University classroom,” she says. Kelleher has been a member of the Syracuse University community for three years and holds a joint appointment between the Department of Earth Sciences in the College of Arts and Sciences (75 percent) and the Department of Civil and Environmental Engineering in the College of Engineering and Computer Science (25 percent). The courses she teaches are interdisciplinary, interactive and emphasize systems thinking. She has developed and offers four courses, a lower-level course on water science, a cross-listed upper level graduate and undergraduate course in hydrology and two graduate electives. “My goal is to for all students to leave my courses with a greater confidence in real-world problem solving, improved scientific literacy and an expanded appreciation and understanding of one of our most fundamental resources,” she says. As a teacher of history, Tessa Murphy wants students to leave her classroom excited to have learned something new, but also questioning why they had never learned it before. In her three years at Syracuse, Murphy has offered courses in early American history, introducing students to an early America that transcends modern political and linguistic borders. Among the courses she teaches is U.S. History to 1865 (HST 101), a large lecture course. Norman Kutcher, professor and chair of history, says Murphy stands out in a department well-known for its high quality teaching. “She is an innovator who has developed strategies that make it possible for her students to discuss controversial issues, a committed teacher whose extraordinary talents are evident in classes ranging from small seminars to large lectures, and a passionate advocate for the power of bringing local history into her courses,” he says.